Especially in relation to Building Sites. To AS/NZS 3500.3.2:2003 "Stormwater Drainage Acceptable Solutions". Designing storm water reticulation for building projects is comparatively easy compared to the design requirements of Municipal systems. However general principles apply to both methods. The design starts by the powers that be deciding on what will be the design flow. This is done by deciding on the acceptable risk, and likely damage if overflowing or flooding occurs. It is uneconomical (and impractical) to design pipes for a storm that is likely to occur only once in 100 years. eg Cyclones, hurricanes etc. Our streets would be taken up with huge pipes. So our Governments, Municipal Authorities, Councils, and people who write the Plumbing Codes legislate the design requirements. The first step is to decide on the design storm. This varies depending on the risk and damage. Big risk and serious damage may require a design storm that statistically occurs only once in 100 years. eg Box gutters have this requirement, whereas eaves gutters (where overflowing generally is only a nuisance) are designed for a lesser storm, once in 20 years. Ground surface areas have even lesser requirements. OK so the design storm frequency has been decided, but how do we find the number of Litres/sec which is required to design pipes? The next step is to decide how long the storm will last, and how much water actually runs off. This is a bit of a difficult concept to get your head around; but it is based on what is known as the time of concentration, and the Coefficient of Runoff. The time of concentration (TOC) is the time it takes water to travel from the furthermost point in the catchment to the point under investigation. To generate peak flow from a catchment, a storm must last at least this long to ensure that the entire catchment is contributing to the flow. The longer a storm lasts, the less is the average intensity. eg a storm may bucket down for 5 mins, but is not likely to keep up such an intensity for hours. For small building sites it may take only 30 seconds for the water on the top of a roof to reach a downpipe. This 'Time of Concentration' is impractical when dealing with statistically generated rainfall data, so the Australian Plumbing Code adopts a minimum of 5 mins for Australia, and 10 mins for New Zealand. The Uniform Plumbing Code and the International Plumbing Code (USA) adopt a 100 year rainfall event with a 1 hour time of concentration. 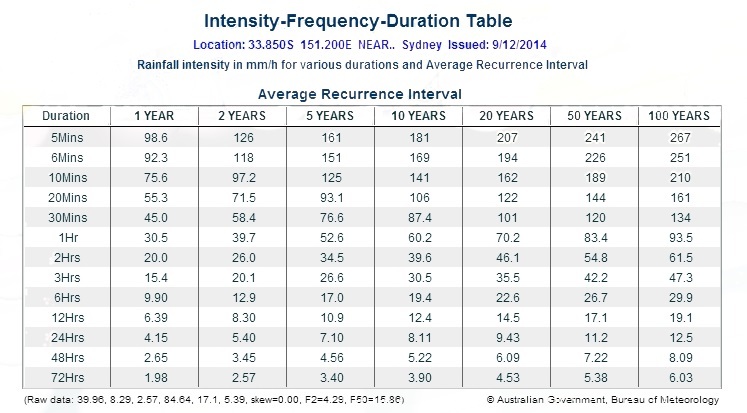 Knowing the storm frequency, now called the ARI (Average Recurrence Interval), and the Time of Concentration, now called the Duration, The relevant Bureau of Meteorology has produced tables and Curves (based on historical rainfall data) called Intensity, Frequency, Duration (IFD) curves. Intensity, Frequency, Duration curves. For Australia. These sites are brilliant. Civil Engineers are going to love these. For Australia they give rainfall intensities for every 2.5 kilometers. Also, your local Authority, Consulting Engineer, or Hydraulic Consultant may be able to advise. The coefficient of runoff is the percentage of storm water that actually runs off. eg a coefficient of runoff of 1, means 100% runoff, a coefficient of runoff of 0.5 means 50% runoff, the rest soaks in, or is held in puddles or ponding etc. For a large pipe network, or for a river, as we move further down the pipe system more catchments are contributing, and the pipeline is getting longer. This means that the time of Concentration (storm Duration) is usually getting longer. Which means that the design storm Intensity is getting less. So the pipe at the end of the system could be designed for a lot less intensity than the pipe at the start of the system. This does not mean a smaller pipe because a lot more catchments are involved. Doing things this way is called the Rational Method. For a building site it is pointless calculating the time of flow down the pipelines with the intention of reducing the Intensity along the way, as it is unlikely to exceed the dictated minimum of 5 minutes. Even if it did the difference would be insignificant. Storm frequency for surfaces. No likelihood of damage = 1 in 2 years. Time of concentration (storm Duration) = 5 minutes, as per code requirements for Aust. Coefficient of runoff, Impervious Areas = 1 , ie 100% runoff from a roof. Pipe Size from the Colebrook-White formula. More flow requires a larger pipe size. Flatter grade requires a larger pipe size. A rougher pipe internal surface requires a larger pipe size. PVC and copper are smooth. Concrete, fibre cement, earthenware, cast iron etc are rougher. The Colebrook White roughness coefficient 'k' in the formula above is 0.015, which is used for PVC. Pipes come in all sorts of materials and strength grades, to help sort out the confusion, pipes diameters are specified as the 'Nominal Diameter' (DN). A DN100 refers to a 100mm nominal dia pipe. The actual internal diameter could vary a few mm either way depending on the material and strength grade. Also, pipes are not made in every possible diameter, in the smaller sizes they increment 50mm to 75mm. Typical sizes are:- DN100, 150, 225, 300, 450, 600 etc. All pipe flow formulas calculate the required 'Internal Diameter' (ID). It would be highly unusual for a pipe to be made with this exact diameter. So the next larger size is chosen. In the smaller sizes, the diameter can increment by as much as 50% eg DN100, next size up is DN150. This obviously increases the carrying capacity as well. So specifying a nominal diameter is OK, as this diameter is usually much larger than the theoretical required diameter anyway. Pipe sizes can also have a velocity limitation. Each Authority may have different requirements. Some impose velocity requirements to limit scour at the outlet and to limit damage to the pipeline. Others impose velocity requirements to limit the energy losses. As in the Plumbing Code. The Australian Plumbing Code suggests that the velocity be kept below 1.5m/s and in no case go above 2m/s. This means that if a designed pipe has a velocity of greater than 2m/s, the pipe must be increased in size until the velocity drops below this. However the Plumbing code has an interesting way of calculating this. Because the Code's velocity limitation is only intended to limit pipeline losses, it is not interested in the velocity of any pipes that aren't flowing full. So the velocity is calculated on the 'full' pipe diameter using the 'actual' flow. This means that if a pipe was half full, the velocity used in the Code limitation would only be half the actual velocity. The formula is:- Q=AV; Where Q=flow; A=Area; V=Velocity. The level of the pipe outlet to achieve drainage. The grade of the surface. Avoiding obstacles and other pipes. Sometimes it is a trial and error process. For a first trial use the grade of the surface. By the way, the purpose of a minimum grade is hopefully to ensure a self cleansing velocity during periods of low flow. The minimum depth of soil over a pipe is also a requirement (pipe cover). This is normally affected by the location of, and material of, the pipe, and the likely vehicle loads. The heavier the vehicle loads, the deeper the pipe must be. Cover requirements range from 100mm for single dwellings with no vehicle loads, to 500mm under roads. Please consult the plumbing code for greater clarification. Pipes under public roads, and Municipal pipework, come under different codes, and Council requirements. Cover is usually much deeper. Please consult a Civil Engineer to design pipes in this location. DP numbers are rounded up. eg if you theoretically require 1.2 downpipes you must use 2. This means that each DP will have more capacity than required and will be over designed, this may result in a larger pipe size than the equivalent surface water pipe. The surface drainage pipe size is dependent on the slope, ie a steep slope will result in a smaller pipe. You must ensure that you never decrease the pipe size downstream. The reason for this is to do with potential blockage problems. Your choices are to either increase the surface water pipe size to match the largest downpipe size, or increase the number of downpipes until a smaller size is reached to match the surface water required pipe size. It is the designers job to juggle the parameters to get the most economical compromise. eg more DP's verses larger pipe size. each case is different and depends on the relevant pipe lengths of each. Using the ARI's, Duration, Coefficients of Runoff, and IFD tables described above, a runoff (in Litres/second) is determined for each catchment draining into the pipe system. This enables the flow in each pipe to be calculated. Knowing the grade (or using the minimum allowable grade) the pipe size is calculated using the Colebrook-White formula above. The nearest available (lager) pipe size is chosen. That's it, end of story. This means however, that the chosen pipe is always larger than theoretically necessary, and as such, rarely flows full. With the velocity limited to 2m/s our energy losses are also minimised, making it unnecessary to worry about calculating the energy losses. Municipal pipework is not designed this way. They like to ensure that every pipe is utilised to its full capacity. So how is this done?. Lets go back to our theoretical pipe size, and choose a smaller pipe and try and make it work. This can be done by increasing the grade, or increasing the pressure on it. Pressure is increased by letting the water level build up above the top of the pipe somewhere upstream. If there is an access chamber or field inlet upstream, the water level will rise here until sufficient pressure is developed to force water through our pipe. The whole system is designed on the water level, known as the Hydraulic Grade Line. The object is to keep the hydraulic grade line below the surface level (usually 300mm) at all openings into the pipework. ie access chambers, field inlets, gully pits, rainwater outlets (RWO's) etc. Otherwise surcharge will occur flooding the place, and that's not good. If there are no openings, as in a domestic house where the downpipes flow directly to the street, the water level can build up in the downpipe. However to do this, the energy losses in the system must also be overcome, which also requires a higher water level upstream somewhere. But it gets worse, the energy losses must be calculated at all the appurtenances in the system. At all access chambers, entry and exit points, bends, junctions etc. Calculating energy losses at manholes properly is a big job, as it depends on pipe sizes, invert levels, and velocities of pipes coming and going, and changes of direction. HYDRAULIC GRADE LINE & "CHARGED" STORM WATER PIPES. WATER DRAINING INTO TANKS ETC. A "charged" pipe is a pipe that stays full, as in a downpipe from a roof that drops below ground and rises up again into the top of a tank. Be very careful with this design and make allowance for access and cleaning the low point of the loop. Anyway carrying on.. Water always flows down hill. That is, from areas of high water level to areas of low water level. It cannot go the other way. Also if there is a difference in water levels, water must flow. We talk in terms of energy, and for the purposes of calculation, energy is converted to a height of water, called "head" of water. So, higher water level = higher energy. A line connecting the water level (head) at each point in the system is called the hydraulic grade line. Head loss, divided by length of pipe between upstream and downstream water levels, is called the hydraulic grade. Dividing the length by the head loss, will give the hydraulic grade in the format of 1:? Now imagine two buckets connected by a flexible hose, the higher bucket will always drain to the lower bucket. If the water levels are equal, no water will flow. And get this, the higher one bucket is above the other, the greater the flow. And to add insult it injury, it makes no difference what the connecting pipe does. It can go up, or down, or around in circles, and as long as the length and diameter remain the same, the interconnecting pipe grade has no effect on the flow. Assuming the pipe diameter remains the same, the only thing that will effect the flow, is the difference in the water level between the entry and exit, and the total length of pipe in between. That is, the hydraulic grade. The hydraulic grade line is also the level to which water will rise, in any connection to the pipe at that location. So if you have a situation where water drains into a tank, or river, or lake, below the water level, or you want to take advantage of the height of the Down pipe, it is the hydraulic grade, not the pipe grade, that should be entered into the pipe formulas. Where k is a coefficient depending on the type of bend, fitting, entry etc. Vinidex PVC pipes design guidelines and everything else. This tells you all you need to know, (and a lot of things you don't need to know,) and were afraid to ask. bends k is about 0.2 to 0.5. If you used the 'actual' pipe grade in the single pipe calculator, this would be the height to which the water would rise above the pipe top, at the upstream end. However, if you join many sections of pipe together, these loses would add up, until eventually water will come out somewhere. Large systems are designed by starting at the outlet and working back, calculating the water level at all points, and adjusting pipe sizes to ensure flooding does not occur. For our purposes, for small building sites, if we drain to tanks, or below the water level of a lake etc, we are going to have full pipes and all this starts to make a difference. However we can make life easier if we add up all the minor losses first, (by assuming a velocity say 1m/sec). So from above, lets say we have 300mm of losses due to entrys, exits, bends and fittings, And lets say we have 1m of water level difference between the entry Water Level and the exit Water Level (not necessarily the pipe invert or obvert level). So the available head we have to play with is 1m-0.3m = 0.7m. Divide this by the length of pipe, and we have what we call the available hydraulic grade. This is what we use in our pipe design formulas. Now once we choose a pipe, we must check the velocity to see if our original velocity assumption was near enough. It can be a trial and error process for a complicated job where there is not much head to play with. The maximum pipe capacity does not occur when the pipe is flowing full. It occurs when the pipe is flowing at a proportional depth of about 90%. The velocity when half full is the same as when the pipe is flowing full. 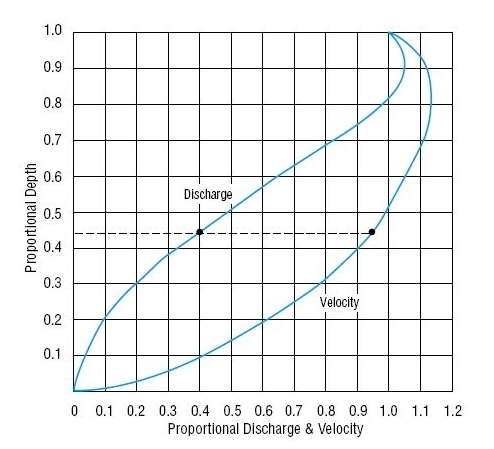 Maximum velocity occurs when the pipe proportional depth is about 80%. of 5 mins. Check out the IFD table below, Complements of the Australian Bureau of Meteorology. A good example of this is the Manning formula, especially useful in Open Channel flow, and pipes that don't flow full. (Or the Hazen Williams formula.) The greater the R the greater the flow. So it turns out, that if you do all the calculations of A & P for a circle, the maximum value of the Hydraulic radius does not occur when the pipe is full. Pipe Flowing Part Full This is a graphical representation.